In an interview recorded for an MSNBC special airing on April 6, the Apple CEO shared his opinion on a variety of hot topics. 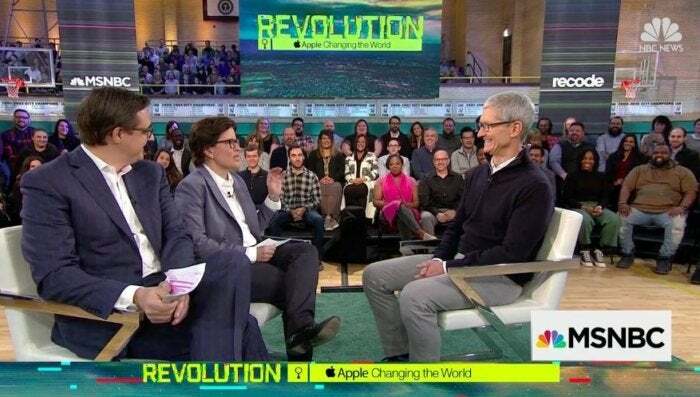 On Wednesday morning, following Apple’s education event in Chicago the day before, CEO Tim Cook sat down with MSNBC’s Chris Hayes and Recode’s Kara Swisher to talk about a variety of Apple-related topics. The interview has not been released in its entirety; it is scheduled to air on April 6 at 8 p.m. EDT as part of MSNBC and Recode’s “Revolution” series. However, it was filmed in front of a live audience, and portions of Cook’s responses have been released. Here’s a sampling of what you can look forward to when the special airs late next week. However, he doesn’t expect everyone to suddenly get jobs making iPhone apps. It’s clear Cook believes education is not just for kids in school. Continuing education is going to be important for everyone, he believes, and it will become the backbone of our jobs market as automation becomes more commonplace. Apple is often criticized for making iPhones in China, with partners like Foxconn and Pegatron. Cook spelled out that, in his view, the idea of Apple’s products being made overseas is misguided. Cook also stressed the idea that Apple is a company that could only have been so successful here in the U.S. He further explained his belief that companies need to give back to their community and their country. “The DACA situation is one that I am personally, as an American, deeply offended by. The DACA situation is not an immigration issue. It’s a moral issue,” Cook said, speaking of the U.S.'s Deferred Action for Childhood Arrivals policy that's aimed at undocumented immigrants who entered the country as children. But it’s not a red vs. blue or liberal vs. conservative issue, in his mind. The full interview with Tim Cook will air on April 6 at 8 p.m. Eastern Time on MSNBC.